Tenge looks for an answer. 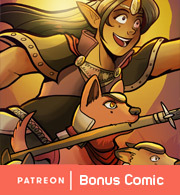  $6+ patrons Behind-the-scenes info about Sydney's paladin squad and a sneak peek at her commanding officer! Iiiiiitttt's SpiderForest Comic of the Week time! Some super-pretty comics this week! Stargazer's Gate takes place in a mystical realm where everything is Not What It Seems. When Atrina Vilanar goes missing without a trace through a mysterious gate, her sister refuses to believe she's dead. Missing memories, errant magic, and some deep secrets lie between her and the truth. 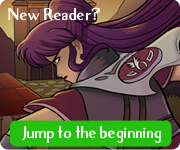 Ti's also drawing an arc over at Spare Keys for Strange Doors right now, so read them both for bonus points! 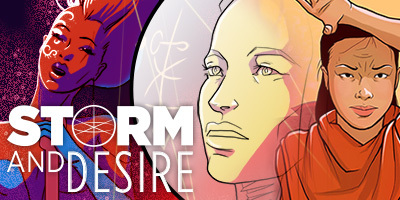 Storm and Desire is sci-fi story about three women from different corners of the galaxy: a martial artist at a remote temple, a singer reeling after the loss of her home, and an engineer on an exploratory mission. There's this amazing pop art aesthetic to the narration text and illustration. Check it out!